I received this book some time ago and finally have the time to start reading it. I am only three chapters in, but could not wait to write about it. 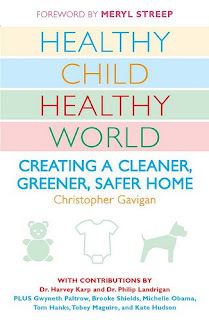 Healthy Child, Healthy World: Creating a cleaner, greener, safer home by Christopher Gavigan is a how-to of sorts geared towards parents wanting a healthy home environment. I feel it is much more than that. My children are older (15 and 13), so I am not a paranoid first-time-must-protect-my-child-from-everything parent, but I do want them to be safe. Along with myself and anyone else who steps foot in my home. This book is packed with invaluable information for anyone wanting to create a cleaner, greener, safer home - no matter what stage you are at on that journey. Whoa. Do I really want to be rubbing pesticides on my body, let alone my child's? 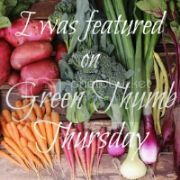 The Healthy Bytes are super simple suggestions that make me stop and say, "Now, why didn't I think of that?". The book also offers DIY tips and recipes and resources on taking the next step. Healthy Child, Healthy World is an easy educational read that will surely become a useful reference guide pulled off the shelf many times in my home. Now if you will excuse me, I am looking forward to Chapter 4: Natural Body Care. Sounds like a great book!! I'll have to add it to my ever-expanding list. Thanks for the review. I just requested it - thanks! Knew they had a web site, didn't know about book. Thanks!